Hello! I got this powder from Kelly's Japan spree, some time back. I think it was $15. Havn't seen it around in SG, so I got it to try since I needed a finishing powder. 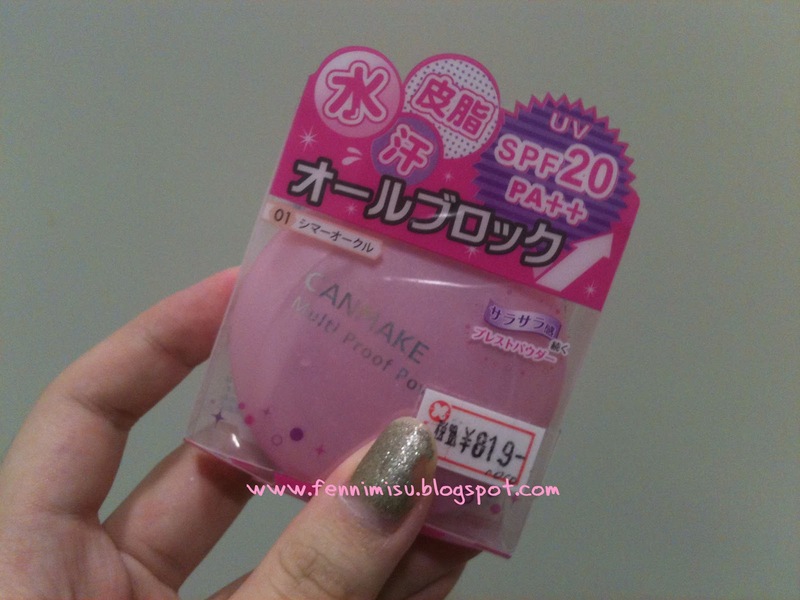 - It's called Multi Proof because it is waterproof, sweat-proof, oil-proof and UV-proof! -I don't think its very lasting cos I apply it in the morning before I go to school, and around 2 hours later, its gone.......... haha. -It smells like sunblock. You know how sunblocks have this little bit of chlorine smell.. haha yeah it smells like that. -Comes with a cute Canmake puff! -Has a little mirror on the back of the top cover when flipped open. -Cheap looking pink plastic case :/ pretty sturdy though. Won't buy this again. Don't even think I'll finish it. hehe.